It was around seven years ago, when I first arrived in Boston as a broke college student that I stumbled upon what I thought was the best deal on lobster in Boston. It was at Tia's on the waterfront and it was ten bucks for a boiled lobster, fries and cole slaw. Fast forward to now, and i think it's now double that for the same lobster, fries and cole slaw. I know what you're thinking. 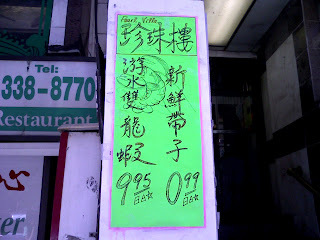 For the love of God, how does anyone outside of Chinatown find out about this deal? Well, they've since added another banner. The asterisk indicates the 'fine print' where you have to order 2 other dinner dishes in order to qualify for the special $9.95 pricing. Not a big deal, considering everyone else in Chinatown is charging double. 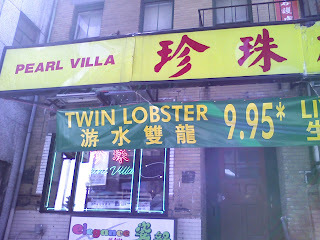 Grab a few friends, have a nice family style dinner, and order the twin lobsters sauteed with ginger and scallion. 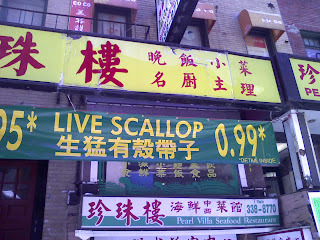 The other special that they have going on is for fresh, in-the-shell scallops. The 'fine print' is that it's limit 1 per person at the special price of 99 cents. After that, it's $1.99 each. If you've never had fresh scallops, they're amazing. Order 1 for each person as an appetizer. Have them steamed with garlic and vermicelli. Pricing that I'm reporting is accurate as of this past weekend. I'm not responsible if it changes. For all my friends out there that faithfully read this blog to support me, ya'll want to grab dinner at Pearl Villa this week? I'm drooling as I type this. 0 Response to "The Best Lobster Deal in Boston"